First it is important to line 4 sheet pans with parchment paper. 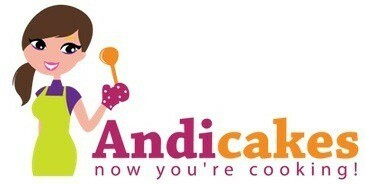 Next open the bags of pretzels and remove so you do not use any broken pretzels. 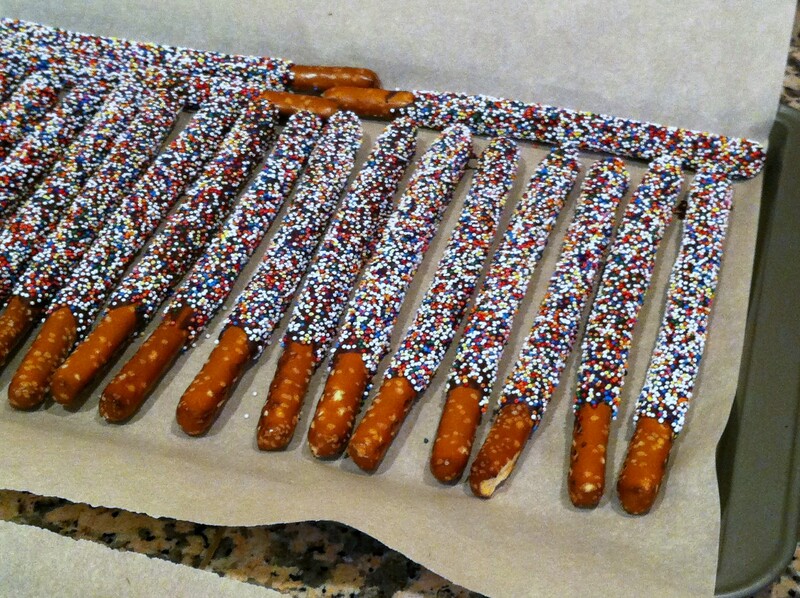 Each bag should produce 75% of flawless pretzels rods. Place anywhere from 15-25 rods on each lined sheet pan so they don’t touch and you are able to determine how many will fit on each pan completed. Next pour both types of chocolate chips into a heat proof bowl and set the bowl over simmering water not allowing the bowl to touch the simmering water. Melt the chocolate chips over the double boiler until melt completely and fully incorporated. 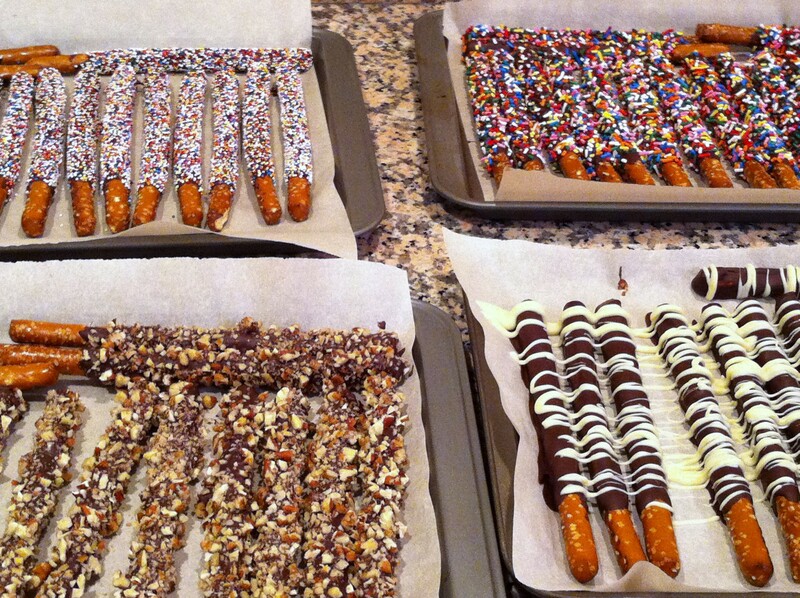 While the chocolate is melting prepare 4 stations, 1 for each of the type of toppings. Find 3 large bowls to capture the excess toppings for reuse. You only need the sheet pan lined with parchment paper for station 4. Once the chocolate is melted, remove the heat proof bowl from the double boiler. 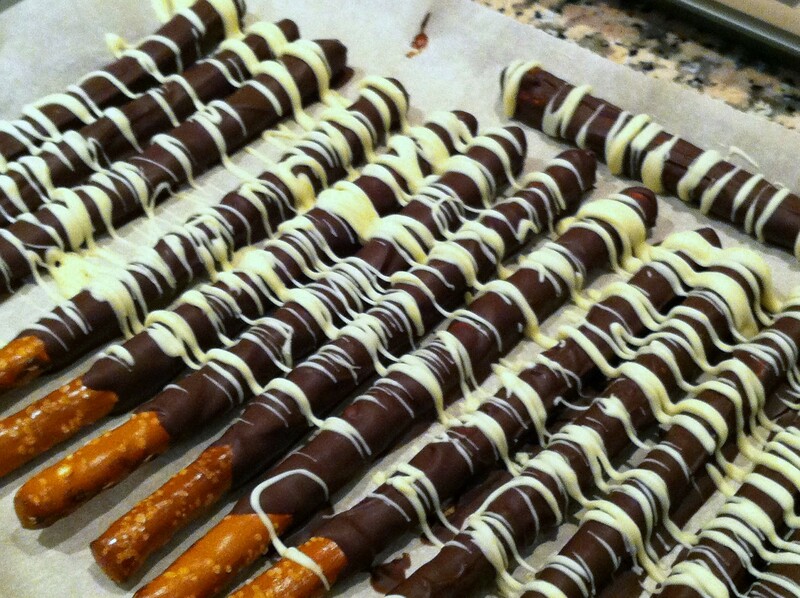 Using a large spoon and one pretzel rod at a time, spoon melted chocolate over 80 percent of the top half of the pretzel rod and allow the excess chocolate to drip off before moving to station 1 to drizzle non peril candies over the unset chocolate on all sides working quickly. 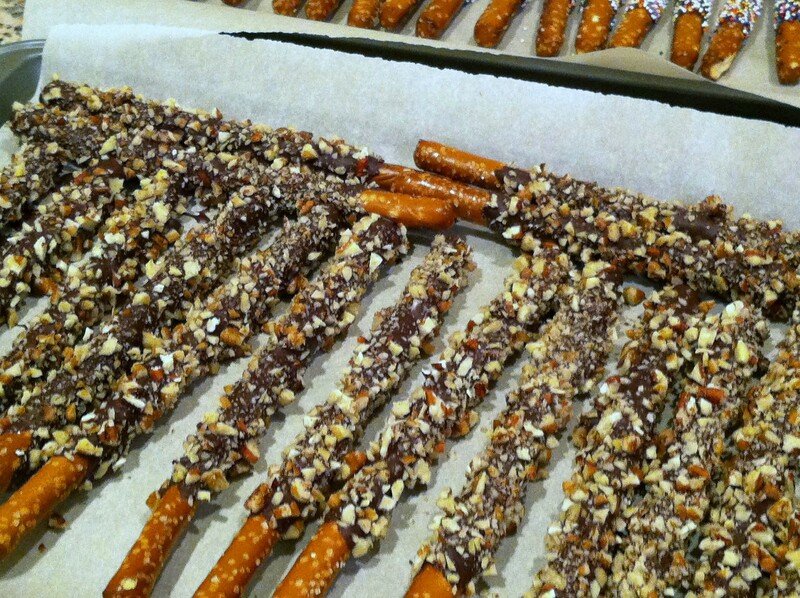 Set the fully coated and topped pretzel on the sheet pan line with parchment paper to cool and continue. Repeat the same procedure with the remaining rods dedicated to station 1 using non peril toppings. Continue to reuse the captured non perils to maximize the amount of rods completed. Once all the rods are completed on one sheet pan set the pan in the refrigerator for 30 minutes to cool before packaging. Repeat the same procedure with station 2, rainbow sprinkles and continue to reuse the captured rainbow sprinkles to maximize the amount of rods completed. Once all the rods are completed on one sheet pan set the pan in the refrigerator for 30 minutes to cool before packaging. Repeat the same procedure with station 3, chopped pecan pieces and continue to reuse the captured pecan pieces to maximize the amount of rods completed. Once all the rods are completed on one sheet pan set the pan in the refrigerator for 30 minutes to cool before packaging. 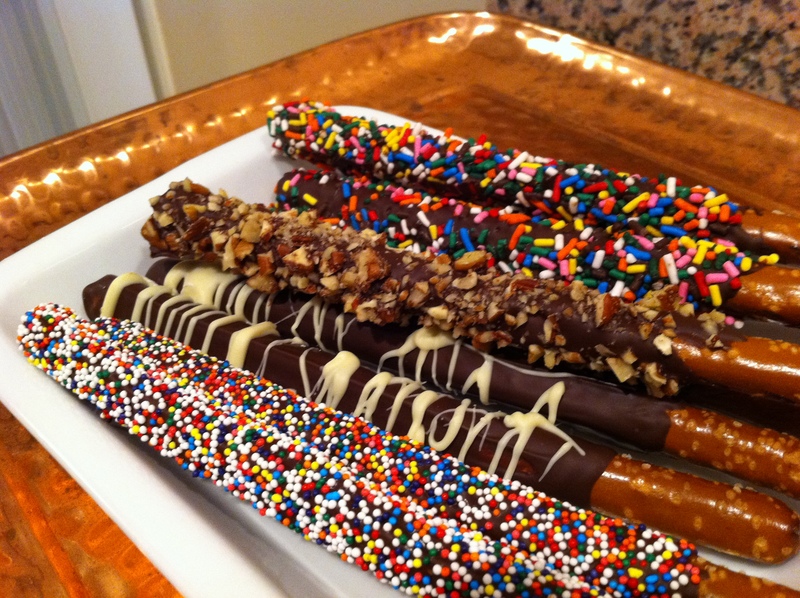 At station 4, the first part of the procedure is the same by using a large spoon and one pretzel rod at a time, spooning the melted chocolate over 80 percent of the top half of the pretzel rods and allow the excess chocolate to drip off. 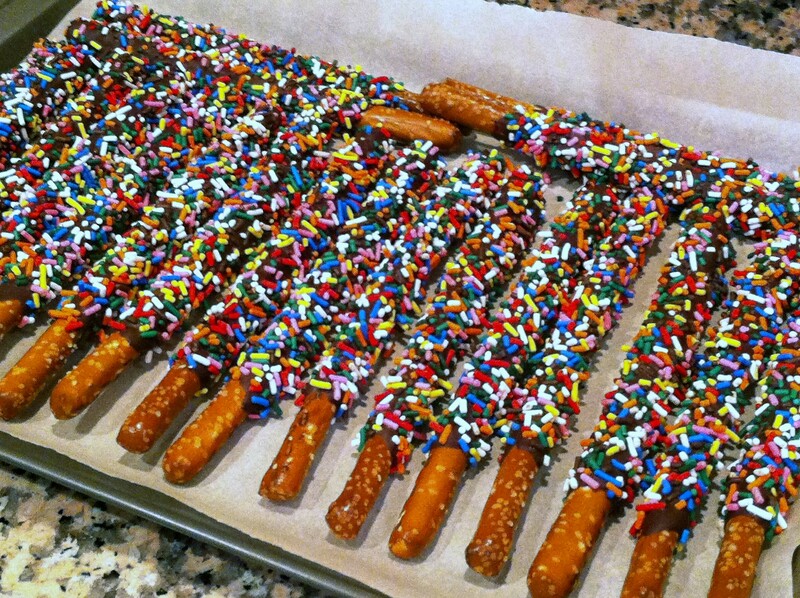 Complete all the rods with only melted chocolate first. Once all the chocolate covered rods are completed on one sheet pan set the pan in the refrigerator for 30 minutes to cool before drizzling with white chocolate. 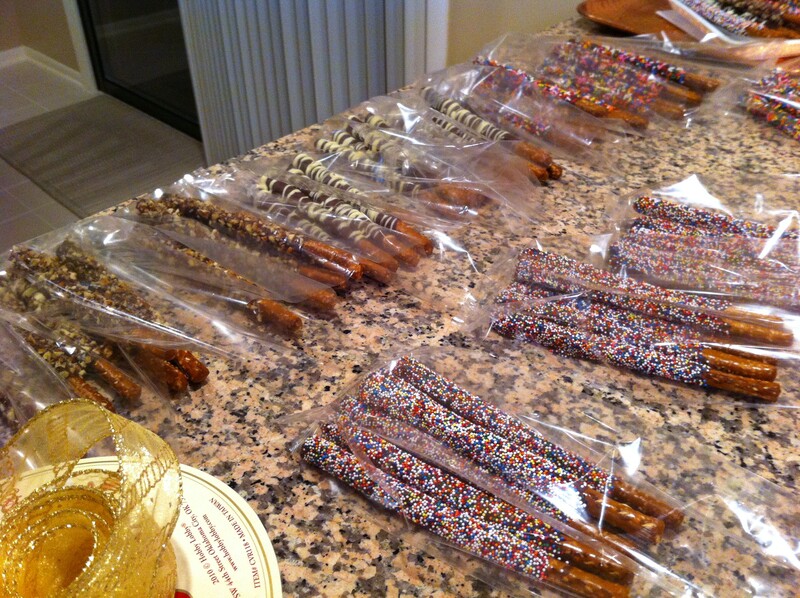 Once the chocolate covered pretzels have cooled in the fridge for 30 minutes complete the topping for station 4 by melting 6 oz of white chocolate in a small bowl in the microwave for 1 ½-2 minutes in 15 second increments stirring between each increment to prevent the white chocolate from burning. Once the white chocolate is melted and whisked smooth take a teaspoon and in one stroke drizzle the melted white chocolate across the entire sheet pan lined with parchment paper with the chocolate covered pretzel rods in one long stroke and repeat 10-15 times until the pattern is ascetically pleasing. Return the sheet pan to the refrigerator to cool before packaging. 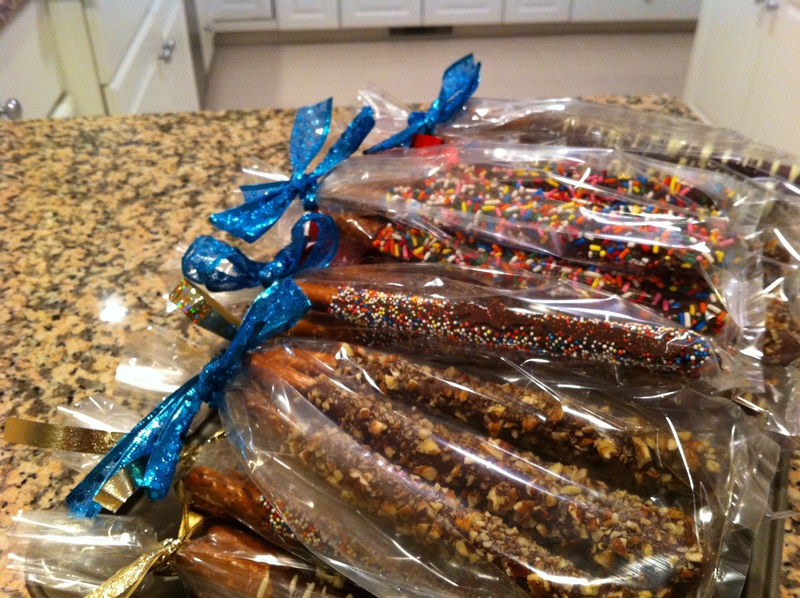 Once all the chocolate covered decorated pretzels have cooled they can be packaged and placed in plastic treat bags tied in ribbons. I place 4 or 8 (1 or 2 of each) per bag. Or 4 bags with 4 of each. Once all the rods are packaged they should be stored in the refrigerator up to 4 days. These look so good. I’m going to be making them for all the adults. Hopefully, they ill share with the kiddies.